If you can't find the answers you need in our User Support Centre, you can submit a support request or simply email support@nesi.org.nz at any time. Research, Science and Innovation Minister Dr Megan Woods today officially opened the new High Performance Computing Facility, which houses New Zealand's newest supercomputers - Mahuika and Māui. Read the official event announcement here. Located at NIWA’s campus in Wellington, the $23m facility is available to all researchers in New Zealand, who can apply for access through NeSI. Thank you for your patience while we have been readying Māui to replace Kupe services for NeSI research projects. Maui is now ready for NeSI users to access. There are some important differences between Kupe and Maui, and you will need to understand these in order to have a smooth transition. Please carefully read the following material before logging onto Maui: Transitioning to Māui – Everything you need to know. If you have any questions or concerns regarding this message, or the support documentation, please feel free to contact the support team. We look forward to supporting your research on the new High Performance Computing Facility! Thank you for your patience as we have carried out NeSI's biggest ever infrastructure deployment and refreshed our HPC Compute and Analytics service. We are now very close to moving you from Kupe to Maui, our new capability platform. We expect to have Maui Services available from the end of the first week of September - there will be some changes in the configuration of Maui Services compared to those on Kupe - but we will document these for you before you make the move. Changes to your workflows should be minimal. Closer to that date we will let you know when you should start using Māui, rather than Kupe. Your home, project and nobackup directories will be synchronised to Māui before this date. Personal directories on nobackup (e.g. /nesi/nobackup/<username> etc.) will not be supported on Maui. Data held in these directories on Kupe will be synchronised to Maui, but with Read Only permissions. Users can then move their files to the relevant project directory. In the meantime - please review support information available on NeSI’s user support portal. If you have any questions about the new platforms, please email support@nesi.org.nz. We reached a big milestone this week on the refresh of NeSI's new platforms and services. All active users of the Pan platform were invited to begin their transition across to the new NeSI platform Mahuika. Pan user access will be ending on Friday the 31st of August 2018, all current Pan projects have been migrated across to Mahuika and researchers have now been asked to register on the new platform. Training is currently underway for researchers who would like some assistance to get on the new platforms. For those researchers that have missed an on-site session, there are still training opportunities and self-help materials. We have also upgraded our support material which has been published and made available to researchers. We are currently planning for the migration of users and their data from the NIWA platform Kupe (which has provided excellent service) to Maui. On 17 July, NeSI hosted a Q&A Webinar to share a brief update on the status of the new platforms and to answer any questions users may have about the timeline and next steps. We expect to begin moving users onto the new platforms starting the week of 23 July. We have finalised most of our dates for user training sessions to help you get started on NeSI new platforms. These sessions will be introductory and cover the basics of getting started on NeSI's new platforms - Mahuika and Māui. For more information on these sessions, click here or email support@nesi.org.nz. Join us for an online User Q&A webinar on 17 July 2018 to get brought up to date on our platform refresh and what's going to happen in the next few weeks to move users onto the new systems. Click here to register for the webinar. Connection information will be sent to all registrants. If you have questions, send an email to events@nesi.org.nz. It has been a busy month at NeSI as our teams have been preparing the new platforms for your projects. Over the last few weeks, we have made great strides in moving user’s data from Auckland to Wellington, installing scientific applications, and bedding down the new processes that will help us manage and support users on Mahuika and Maui. Unfortunately, June also brought some unforeseen delays related to one of the new technology components, resulting in our initial setup phase taking longer than expected. Those issues have since been resolved and we are back on track to get users onto the platforms within the next few weeks. We apologise for this unexpected change in timeline. We are pleased to report that we are now entering the home stretch and expect to begin welcoming users onto the new platforms by late July. Thank you to everyone who has expressed interest in attending our training sessions. We will be announcing the dates & times at our upcoming User Q&A Webinar on 17 July. Click here to register! Note: these training sessions will be introductory and cover the basics of getting started on the platforms. All training materials will also be documented and available on Github and linked to a new User Support portal on the NeSI WebSite (which will replace the existing user support pages). Effective immediately, all new project applications will be assessed for allocation on Mahuika or Maui, with expected start dates in August. This will enable these new projects to be among the first users accessing our new platforms, but it also means that any delays in bringing Mahuika online will inevitably delay a new project’s allocation start date. If you have questions about this, please contact support@nesi.org.nz. Note: If you have an existing active project with an allocation that is due to expire in July, we are assessing renewal requests on a case-by-case basis. Please contact support@nesi.org.nz for more information. These sessions will be introductory and cover the basics of getting started. New users are strongly encouraged to attend! Note: These training materials will also be documented and available on Github for reference and self-serve support. If you have any questions regarding training, please email support@nesi.org.nz. In preparation for moving to the new platforms, there will be a period where we will not accept new projects on Pan. This will likely begin in early to mid-July, once the new platforms are brought online. We will continue to accept applications for new NeSI projects through this period, but they will be provisioned on the new platforms in July (or later if a delayed start is appropriate). If you have a currently active project with an allocation on Pan, and that allocation is due to expire in June, you can request a new allocation by emailing support@nesi.org.nz. We will consider requests for new allocations on active projects on a case-by-case basis. If we do not offer you a new allocation on Pan, we will consider your project for an allocation on one of our new clusters. If you have questions about this, please email support@nesi.org.nz. We are getting closer to Maui and Mahuika being live and available for use by NeSI projects. More information on the new service enhancements, such as two-factor authentication, will be shared in the coming weeks. We are currently aiming to open access to Mahuika and Maui by late June 2018, at which point you will be able to login and run jobs. This access date is dependent upon a number of factors, and may need to change. We will notify you when a date is confirmed. In the meantime, you can continue working on Pan. You will have access to both Pan and Mahuika for at least one week after the first date of access. This transition period will allow you to gain confidence working on Mahuika and confirm that your data has been migrated to Mahuika before access to Pan is closed. Your home and project directories on Pan will be synchronised to Mahuika up until the day you are migrated to Mahuika. Projects that span the transition from Pan to Mahuika will be transferred, taking account of: usage to date, NeSI’s Allocation aging policy, and the change in performance between Pan’s CPUs and those on Mahuika. Confirmation of User Training Sessions and related documentation will be confirmed soon. A new User Support Portal will provide extensive information on NeSI processes, the new HPCs, storage management, scientific programming environment, job scheduling policies and practice, and user support. More information related to migration and the new platforms will be provided closer to the changeover date. We are aiming to make this transition as easy as possible. If you have any concerns, reach out to us at support@nesi.org.nz. Our next New Platforms Q&A webinar will be scheduled for mid-June. Once a date is confirmed, we will advertise it via email and with a post on this page. If you have any questions between now and then, please email support@nesi.org.nz. If you have additional questions about using Kupe, contact support@nesi.org.nz. Stay tuned for further 'Tips & Tricks' webinars once the new platforms go live in June. NeSI is currently on track to provide user access to the new platforms in July, as both Maui and Mahuika have been successfully installed, passed scientific benchmark acceptance tests, and tailoring and configuration of the systems for NeSI use is well advanced. Interested in this training? Pre-register here. These sessions will likely be held in July. They will be hands-on and allow users to interact with the platforms and walk through steps such as how to log in, submit jobs, transfer data, use the scheduler, and more. The training dates have not yet been finalised as they depend on when we can complete the tailoring and configuration of the machines. Once confirmed, they will be advertised widely. File systems, directories and quotas: Where should I put my data? If you have questions about user training or anything related to the platforms refresh, contact support@nesi.org.nz. RSVP by clicking the link below. The webinar connections details will be sent to all RSVPs. If you have any questions about the platform refresh, email support@nesi.org.nz. Over the next few weeks, we will be installing NeSI’s new systems, Mahuika and Maui. Once these systems are ready, the NeSI team will begin copying and synchronising all Pan users’ and project teams’ data to the new shared storage. This copying process involves transferring more than 200 TB of research data in tens of millions of files over the REANNZ network. In order to reduce the impact of this operation on the Pan filesystem, this will take some weeks to complete. Review your project files and directories to clean up and remove any duplicated or unneeded files, or project files you have finished working with on Pan. If you have any project data stored on Pan that you no longer require, please move it to your own local storage and/or delete it. Remove any checkpoint files or intermediate files from completed jobs, as well as unneeded output and/or error files. Consider deleting any large data files that can easily be regenerated. Consider making a local backup of your important data. NeSI will copy your data over to the new systems, but if you have critical software and/or research data stored on Pan’s filesystems that you are particularly concerned about, we encourage you to make a local backup. If you wish to reorganise your files and directories, please do so before Friday 16 March. After Friday 16 March we will not grant increases to disk space or inode (file count) allocations on Pan, unless there are exceptional circumstances. Your assistance during this migration is appreciated and will help us get you started on the new systems. If you have any questions about how to prepare your data or about migration in general, please email our support team at support@nesi.org.nz. May 2018 — Project migration begins. Pan users move to Mahuika. Kupe users move to Maui. We plan to host another User Q&A webinar before the systems are brought online in May. We will post more information here when the date and time are confirmed. If you have any questions in the meantime, please email support@nesi.org.nz. Click the links below to register for the session. Webinar connection details will be sent to all registrants. FitzRoy is no longer accessible to users. The NeSI/NIWA team have shut down the system and the deinstallation process has begun. Over the next month, the High Performance Computing Facility that housed FitzRoy will be renovated and upgraded to prepare for the arrival and installation of Maui and Mahuika in late February. If you have questions about our platform refresh, contact support@nesi.org.nz(link sends e-mail) or visit our FAQs. The NeSI/NIWA team removing FitzRoy, which has supported users since 2010. 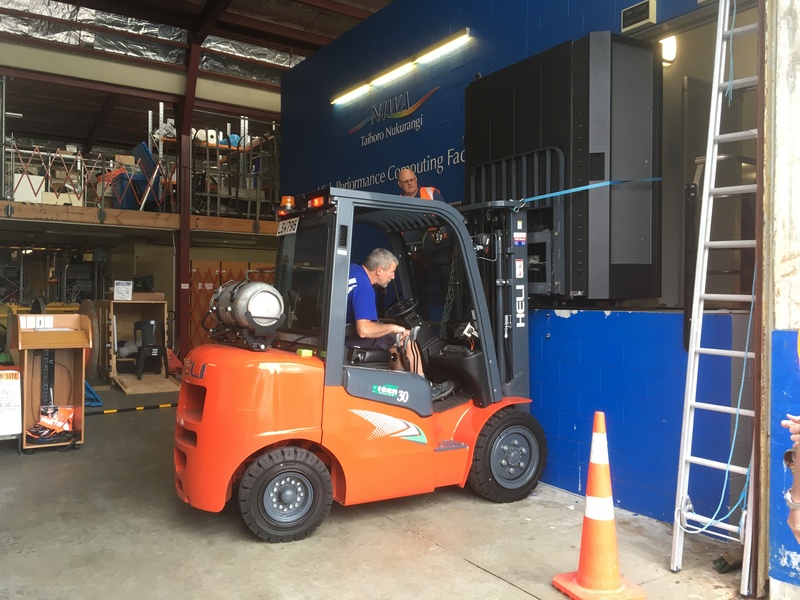 FitzRoy users have been successfully migrated to Kupe, which will provide temporary supercomputer services until all NeSI users are moved onto Mahuika and Maui in the new year. The renovation and upgrade of the High Performance Computing Facility plant at Greta Point is underway and the installation of Mahuika and Maui will begin in February. We expect to begin migrating and training users on those new NeSI systems in early 2018. For a more detailed status update, click here. If you have questions about our platform refresh, contact support@nesi.org.nz(link sends e-mail) or visit our FAQs. Tips and documentation for using Kupe can be found here. The NeSI team is in the midst of setting up setting-up Kupe (HPC3), the transition machine for FitzRoy users, and migrating users. NeSI and NIWA users of FitzRoy will already have been contacted via email about the details of the migration. If you have not heard from us on this, please contact us as soon as possible via support@nesi.org.nz. Support materials for Kupe are here and are being updated regularly. During October we presented the capacbilities of the new system via webinar. If you missed one of these sessions you can watch the recording here. NeSI is in the process of installation of our new platforms. The next phase will be to get the new machines up and running and researchers transitioned over. After all users have been successfully migrated, the old platforms will no longer be supported. This migration is currently underway and those effected will have been contacted via email. If you use FitzRoy and have not been contacted, please let us know as soon as possible via support@nesi.org.nz. We look forward to working with you to make your transition to the new platforms as streamlined as possible and minimise the impact on your research. If you have any questions at all about the migration or impact on your project, please contact the team at support@nesi.org.nz. On June 8 NeSI announced a new integrated supercomputing platform to power computational and data intensive research in New Zealand. Science and Innovation Minister Paul Goldsmith announced the joint investment by NeSI and NIWA at the signing of a six-year contract worth $31.7 million with global supercomputer leader Cray Inc. This investment replaces and expands NeSI’s national compute and data platform, extending its scope and performance to meet changing needs, and will be commissioned by early 2018. Since signing the contract with Cray, our combined teams have been refining the design of the new High Performance Computing (HPC) systems, and the services they will provide. Here are the current and future features and technical specifications of the new NeSI HPC systems and how these could benefit research. Q: Will the software package I use on NeSI still be available on the new platforms? A: Most of our currently supported software with a history of recent use will be deployed and we will prioritise the most heavily used software for early deployment. Some packages will not be migrated due to technical or licensing limitations. If you have an urgent need for a particular package on migration to our new platforms, contact us now at support@nesi.org.nz with your project code and the software package name and version. Q: The software I use in my research has licensing restrictions. Will I still be able to use it on the new platforms? If your software relies on checking out tokens from a licence server at your institution, we may need to work with IT personnel at your institution to open ports or configure appropriate firewall rules. If your software is licensed to run on computers owned and operated by your institution and/or housed at a particular campus or office, we may not be permitted to install that software on our new platforms. If you are concerned about licensing restrictions for the software you use, please contact support@nesi.org.nz with your project code and the name and version of the package.